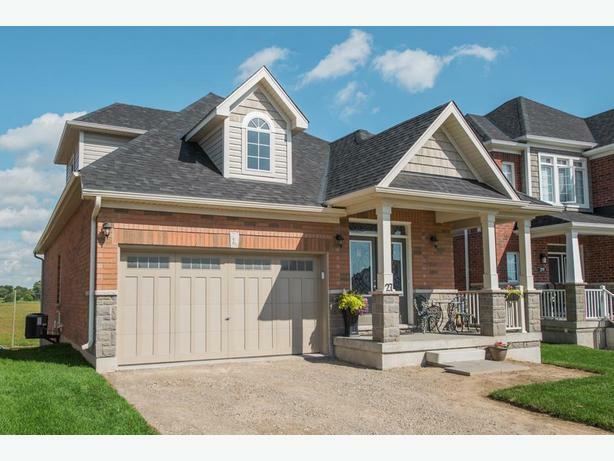 Remarkable "The Plateau" Model 3 Bedroom Bungaloft Built in 2015 In the New Highland Ridge Of Orangeville Neighbourhood On a Peaceful Court With High End Finishes And Walk-Out Basement Close To All Amenities. Open Concept Home With Large Granite Counter Eat-In Kitchen, Kitchen-Aid Stainless Steel Appliances Including 5 Burner Gas Stove, Abundance Of Rich Extended Cabinetry With Upgraded Hardware, Pantry & Under Cabinet Lighting And Open To Family Room With Vaulted Ceiling, Gas Fireplace And A Walk-Out To Future Deck With California Shutters And Dark Oak Flooring that Carries On Through Most of the Home. 2 Bedrooms On Main Level, Master Bedroom With Sitting Area, Large Walk-In Closet And 5 Pc Ensuite With Soaker Tub, Dual Vanity And Walk-In Shower. Grand Staircase Leads To Loft With Overlook to Living Room & Sitting Room Has Overlook To Kitchen & Family Room. 1 Bedroom With Double Door Closets And 4 Pc Bathroom With Upgraded Vanity On Loft Level. Basement Awaiting Your Finishing Touches With Partly Finished Room, Rough In 3 Pc Washroom, Cold Cellar And Oversized Walk-Out To Backyard Lets In Ample Natural Light.